Ah, Thailand. Friendly people, great food, excellent prices, which reminds me of a trip to Krabi, on the southern coast, by an azure sea, with a beautiful beach, and fragrant coconut oil spread deliciously over…ah,but that’s another story. I will say this. There were vast amounts of Singha Beer involved and my recollection is as fuzzy as a cotton picker’s navel. Ok, curry. Thai curry. How is that different from Indian curry? Are you nuts? Taken leave of your senses? Everyone knows that Indian curry comes from London and Thai curry comes from a really cute chick wearing a sarong. 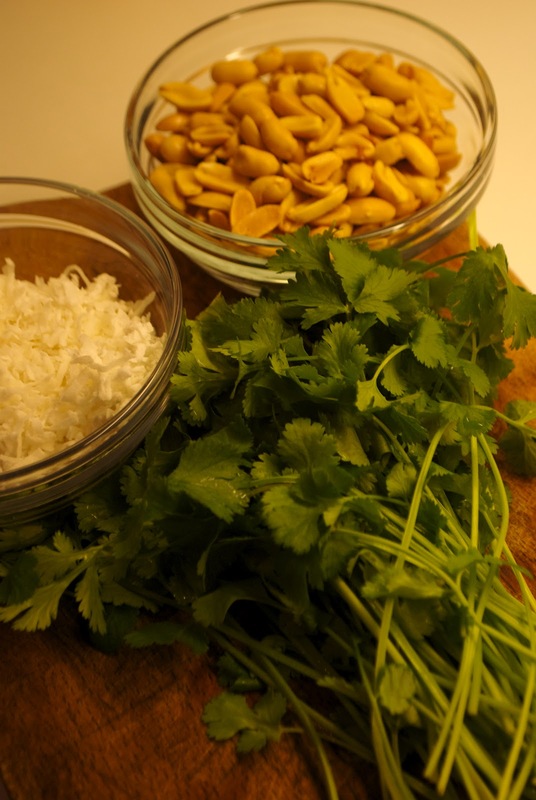 This time, let’s forego the distant travel (biting tongue, holding back tears) and bring Thai curry to our own kitchen. But, before we get started, let’s get one thing straight. There are as many different Thai curries as there are Thai cooks. So mine isn’t the Thai curry you remember from the drunken weekend in Bangkok? Dry up, quit whining, and pass me an icy bottle of Singha. A recipe for Tomato Chutney follows the curry recipe. 2 14 oz cans coconut milk (.8 Liters) Open them one at a time. You’ll see why in a minute. 3 Tablespoons curry powder (or to taste) I use a mixture of hot and mild. 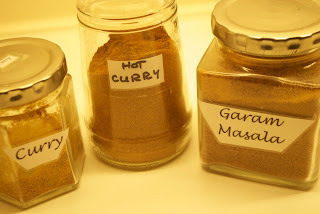 1-2 Tablespoons garam masala. I know this is an Indian mixture, but I like it. Don’t have any? Just season as necessary with more curry powder. 2. As the chicken is grilling, heat the oil in a pan, add the garlic and stir. Add the sliced onion and cook until wilted. 3. Add the chicken, the first can of coconut milk, all the spices, and the fish sauce, and cook until all the spice is blended and the sauce begins to thicken. If you don’t have enough sauce, add all or part of the second can of coconut milk. Taste and add more salt, or spice as necessary. 4. Serve over rice and garnish individually. I like to serve tomato chutney with my curry, even though it is definitely not Thai. Easy to make. Difficult to forget. Heat the oil in a pan and add the spices. When the seeds start to jump, add the tomatoes. Thin slice the lemon half and place the slices over the tomato mixture. 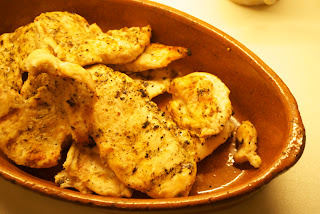 Cook for about 15 minutes, stirring frequently, until the sauce has thickened. Stir in the raisins, sugar, and salt. Stir until all sugar is melted and the sauce is consistent. Taste a scrumptious bite of the curry. Takes you back, doesn’t it. Makes you wish you were single, I mean you had more than a single serving. 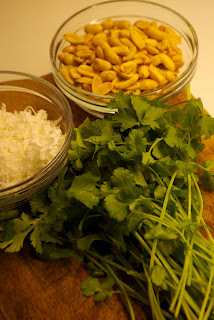 Several questions about my Thai curry are constantly thrown my way. 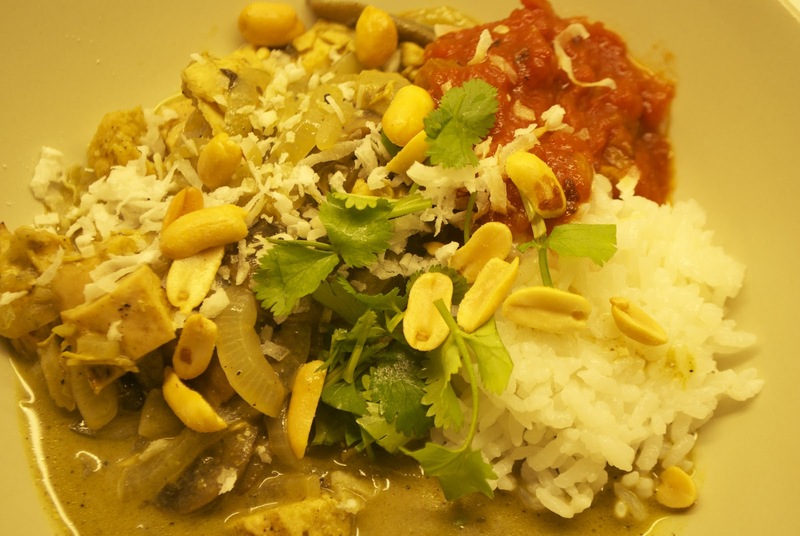 Will Thai curry cause your heart to flutter and your eyes roll back? No, but it will make you forget Budweiser, fill your nostrils with a strong scent of coconut oil, and leave you yearning for the beach. Will Thai curry increase your sexual awareness to the point that your dog whines, while your wife, and many of the neighbors pretend to be asleep? Likely, but no personal experience. Wink, wink. Love the humor with the recipe - had me laughing out loud and then I had to read it aloud to Chris because he was wondering why I was laughing! Good stuff. I have never made tomato chutney before, but will definitely try. I love the color and composition in your photos - straight out of a magazine!